ATEN's 17" LCD integrated console and 8-port IP KVM bundle offers a streamlined and economic approach to IT environments. The CL1000M, incorporates a keyboard with touchpad and a 17" LCD monitor into a 1U Slideaway housing. 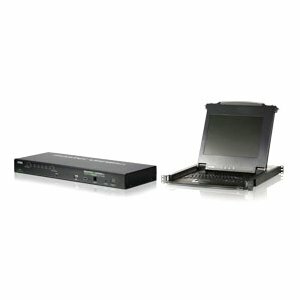 The bundled ATEN IP KVM, CS1708i, allows you to manage 8 computers either directly from the CL1000M, or remotely from anyplace on your network or the internet.